Karen Burns-Booth serves up a spectacular celebration trifle recipe – the ideal centrepiece to any Christmas table. Trifle, that most quintessential of British desserts, layers of fluffy cream, dreamy custard, sherry soaked cake, fresh berries and tangy jelly, all bound together in one large bowl of deliciousness. Always seen on the Christmas tea table, as well as other celebratory occasions throughout the year. By using a2Milk in the custard and dairy-free amaretti biscuits at the base with a swirl of coconut cream on top, people who find regular milk hard to digest can have their trifle and eat it! 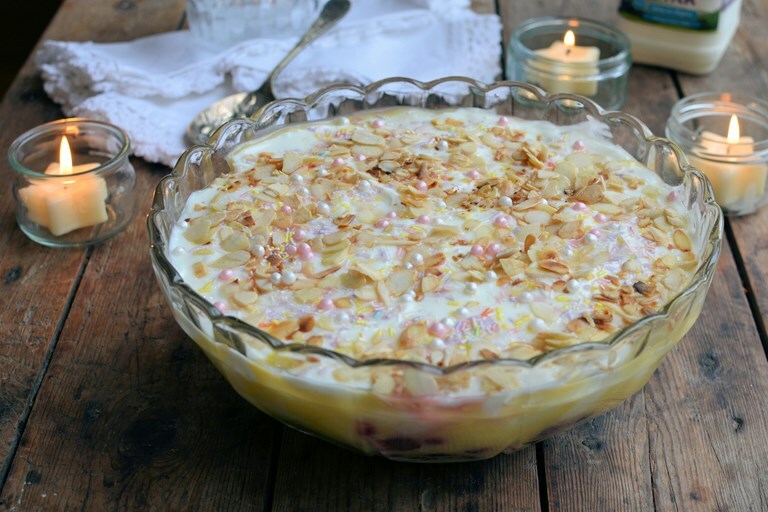 My recipe for Celebration trifle is just as decadent as any that is made with normal milk and cream, and even people who are not lactose intolerant will enjoy it.